A really nice outdoor table! Like it a lot. Just had to put lifts on the legs.... it is a little to low for my patio furniture! 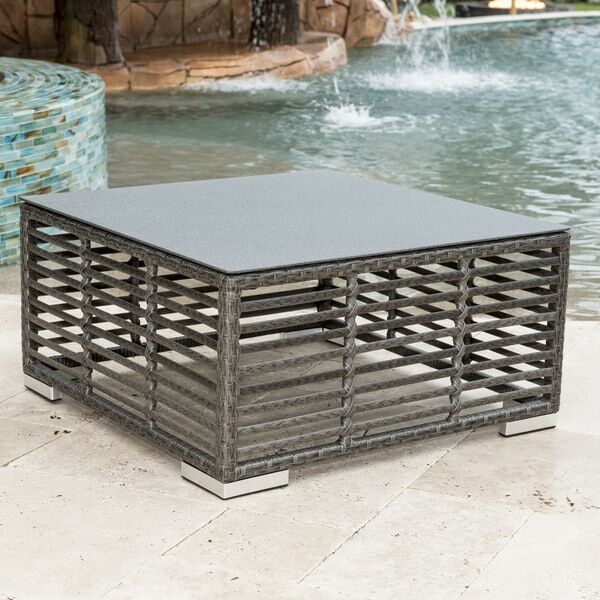 Enjoy poolside refreshments or snacks in the garden on this square coffee table from Panama Jack. Handcrafted from synthetic wicker made from resin and boasting a sturdy aluminum frame, this weather-resistant coffee table stands up to Mother Nature's whims with ease. We live at the beach and this has withstood the elements. Its sturdy and modern looking. Nice table, alittle lighter weight than expected, but great quality! We have had the table outside for over a year and it has held up well! I love this table, my only issue is that its not as big as i thought it would be and I really need more width when paired with a sofa and two chair combo so my solution is to order one more and have two side by side! This table arrived with the glass top shattered. In the process of trying to get a replacement. Great patio table. Looks just as pictured, very happy with my purchase. Fits perfectly on my deck. Love the style.